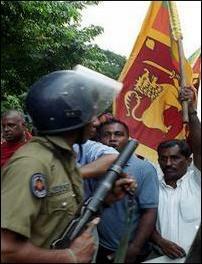 Leaders of the extreme Sinhala nationalist party in Sri Lanka, the Sihala Urumaya (SU), members of the Marxist and Sinhala nationalist Janatha Vimukthi Peramuna (JVP), hundreds of the parties' supporters, including Buddhist monks, held a demonstration in Colombo against the Sinhala-Tamil cultural event being held at the Colombo Town Hall Thursday, sources in Colombo said. 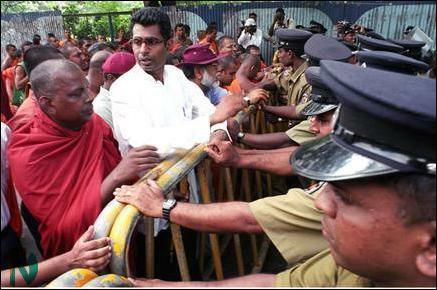 The leaders of the SU, Mr. Thilak Karunarathna, Thebuwana Piyananda and Champika Ranawaka, and Buddhist monks started the demonstration march Thursday morning in front of the Buddha statue at Town Hall. When the two-day cultural event started Wednesday, members of the SU, the JVP and their supporters attacked the people participating at the festival, injuring several people, including two journalists, sources said. The Police arrested the SU's deputy chairman and others who are allegedly members of the SU and the JVP, for instigating and carrying out the attack, sources said. The demonstrators on Thursday shouted, “Release our arrested party deputy chairman and others," “Why not arrest Sinhala Tigers?” and other slogans. "Sinhala Tigers" is a reference to the Sinhalese people participating at the festival. 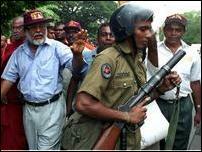 The SU and other extremist parties accuse them of being sympathizers of the Liberation Tigers of Tamil Eelam. 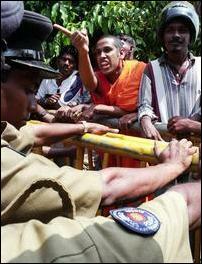 The Police prevented the demostrators from going near the Sinhala-Tamil cultural hall, stopping them in front of the St. Bridget's school roundabout. 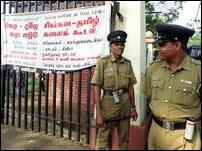 More than two hundred police personnel with the water cannon and tear gas unit were deployed to ensure security for the attendees of the Sinhala -Tamil cultural Festival, according to security sources.